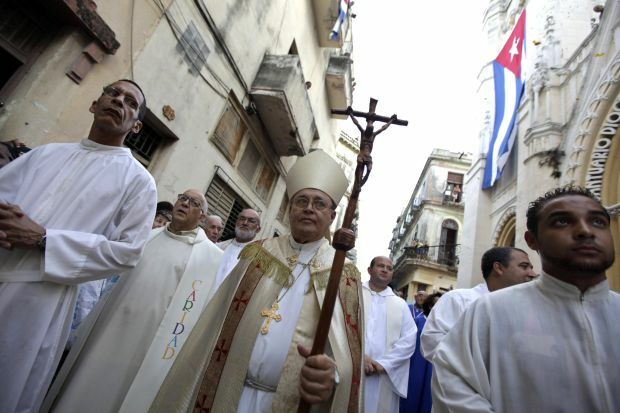 ROME (CNS) — The move to normalize relations between Cuba and the United States has inaugurated “a new time … for encounter and dialogue” between the two countries and is cause for great hope, said the cardinal of Havana. “The wall of distrust between the United States and Cuba seemed indestructible,” said Cardinal Jaime Lucas Ortega Alamino, referring to the 52-year-long U.S. embargo against Cuba. Cardinal Ortega was speaking at Rome’s Basilica of St. John Lateran Feb. 9 during a Mass to mark the 47th anniversary of the founding of the Sant’Egidio Community. The Italian lay movement, whose mission is largely among the poor, operates in more than 70 countries, including Cuba. After 18 months of secret talks, U.S. President Barack Obama and Cuban President Raul Castro announced in mid-December their decision to normalize diplomatic and trade relations. Both leaders credited Pope Francis with helping to secure the deal. The pope had been following and supporting the talks. He had also written personal letters to both leaders and the Vatican hosted a secret meeting last fall. “My heart is full of great hope for the future of the Cuban people and I am happy to share this joy with you this evening,” he told those assembled. “Dialogue is the bearer of good for everyone,” he said. He noted the ongoing conflicts worldwide, calling for prayers for the situations in Ukraine, Syria and Iraq. He said he hoped the sea change in relations between Cuba and the U.S. could “be contagious to the entire world” so that dialogue may be taken up where there is fighting.